In a large skillet, cook bacon over medium heat until crisp. Remove to paper towels with a slotted spoon. Saute onions and apples in drippings until tender. Stir in the chicken, jelly, thyme and salt. On a lightly floured surface, unfold puff pastry. Roll into a 10-in. x 9-in. rectangle. Transfer to a 15x10x1-in. parchment paper-lined baking sheet. Prick with a fork. Spread chicken mixture over pastry to within 1 in. of edges. Sprinkle with cheese and pepper. Press edges with a fork, forming a decorative border. Bake at 425° for 10 minutes. 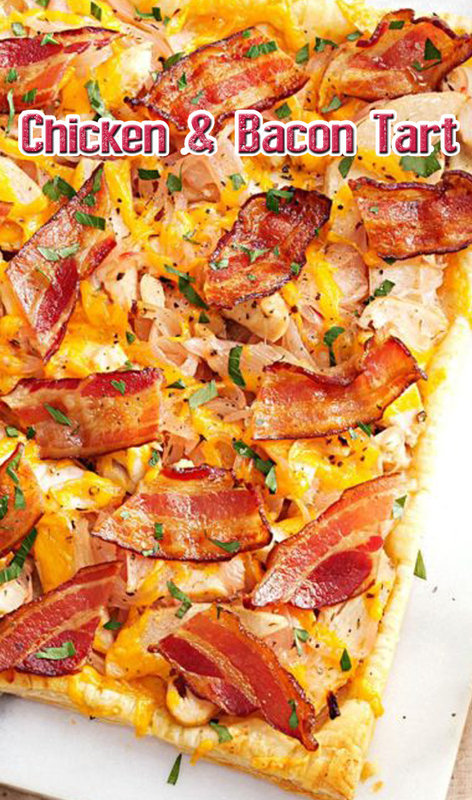 Sprinkle with bacon; bake 5-10 minutes longer or until golden brown. Sprinkle with parsley.